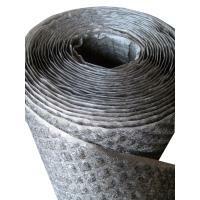 DriwalI Rainscreen is a drainage mat for exterior wall systems. The entangled net product eliminates incidental moisture problems in most exterior veneer applications, including stucco, manufactured stone, and plank siding. With the increase in building “tightness” for thermal protection, moisture problems are on the rise, causing a greater need for hydrostatic pressure release and a ventilation method. Due to settling of the home and wind driven rain, incidental moisture will penetrate behind the veneer and will need to drain to the exterior. Driwall Rainscreen is your solution. The full-wall DriwalI Rainscreen product rolls over the weather-resistant barrier to separate it from the exterior veneer. The airspace that DriwalI Rainscreen creates increases airflow through the wall cavity, allowing the wall to breath and stay dry. Driwall Rainscreen absorbs and releases no moisture and does not mold, mildew or grow any bacteria. With lightweight rolls, it is easy to handle and simple to install using mechanical staple hammer. Full applications include: stucco, thin stone or brick, manufactured stone, stone and brick masonry, fiber cement board siding and wood siding applications.